Competition swimsuits have traditionally compromised between compression (to achieve optimum muscle power) and optimum fit and comfort (for freedom of movement). A tight-fitting garment provides greater muscle compression but loses freedom of movement, with the converse being true for a loose-fitting garment. Now, with the Arena Carbon-Pro, this kind of compromise is a thing of the past. The Carbon-Pro offers both maximum muscle compression AND total freedom of movement, thanks to the unique properties of its carbon-based fabric. Not only that, the benefits kick in from the moment you pull on the suit, and last until you touch the wall at the end of your race. Intelligent Compression: Stiff, strong carbon fibres combined with high-stretch elastomer yarns in a woven construction create a ‘lock-out’ effect. These fibres lock down when a critical stretch level is reached, much like a car’s seat belt is locked when the vehicle experiences a high impact. With a swimsuit, the lock down of the carbon fibres maximizes compression on over-extended zones, increasing support and control where it’s needed and when it’s needed. 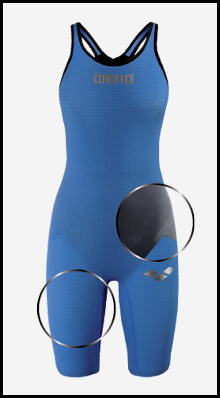 At the same time, the stretch fabric remains comfortable without compromising the swimmer’s mobility. Power Return: Strategic placement of elastic bonding tape on the inside of the legs and the gluteal muscles delivers added power through a “spring back” action on each dive, kick, and turn. The tape stretches as you push off, helping to give a better glide as you start each lap, preserving its optimal fit and freedom of movement throughout. The tapes even help your pre-race stretching and warm-up, so that you can preserve your energy for when you most need it – in the race. Improved Surface Integrity: The Carbon-Pro’s high-performance woven fabric (190g/sqm) reinforced with carbon fibre delivers the ultimate strength-to-weight ratio for combined speed and power. The superior strength of this fabric translates into a stronger suit, with less chance of tearing or damage that can result from extreme stretching while putting the suit on. Preservation of the integrity of the swimsuit’s surface in turn maximizes drag reduction and optimizes water repellency. For international deliveries we use Royal Mail Air Mail. Air Mail can be one of either Tracked, Signed For or Tracked & Signed For. The delivery method selected is dictated by the options available in the delivery country. If you require an order urgently we can also use UPS. This option is available at checkout for most European countries. If it is not available for your delivery country and you would like a quote please contact us at [email protected]tore.com and detail the items you require and the full delivery address including any zip codes.